Well it’s that time of year again where Dr Seymour and myself headed off to update our CPR skills. 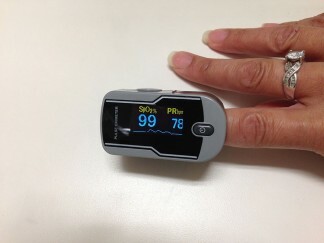 This time round we focused a little more on fainting patients and using the finger pulse oximeter. The oximeter is a portable non-invasive, spot check of oxygen saturation of arterial haemoglobin and pulse rate of an adult and paediatric patients at home and in hospital. A healthy patient: Pulse rate should sit between 60-100 per minute for an adult, and a child between (9-15 years) should be 80-100 per min. A healthy patient: SpO2 (oxygen saturation) for an adult, and a child from (9-15years), should be also 95%-98%. However, pulse rate adult and child (9-15 years) of above 100 per minute or below 50 per minute, and SpO2 (oxygen saturation) for an adult, and a child from (9-15years) below 95%, and in adults of below 88% (COPD) chronic obstructive pulmonary disease. These readings indicate a person going into shock. So if for some reason you notice that a person does not seem right or their showing signs of poor perfusion (example) they appear to be confused or aggressive look pale or cold and sweaty its important that you reassure the patient and deal with the situation at hand in a calm and collected manner. The first step is to lie the person down. If they improve with lying down then give oxygen at the appropriate levels if the oxygen perfusion is low. 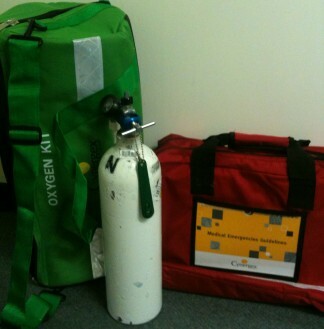 We have an oxygen tank that is regularly checked. When we do the training you only get a taste of how stressful the situation of cardiac arrest can be. Being aware of the possibility is important. Thankfully it’s a rare event. However we have an ageing population so the possibility may increase.